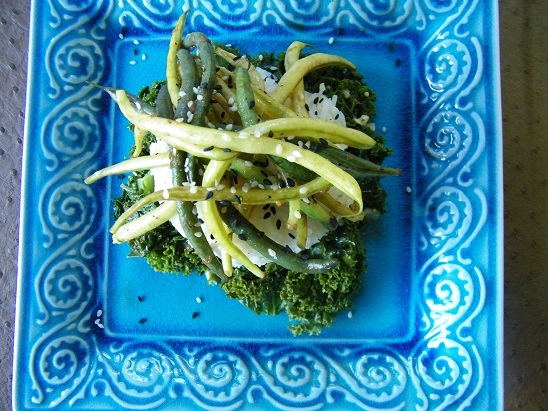 These ginger-flavored green beans were served on a bed of kale and white jasmine rice. Upon tasting the crisp beans, the flavor of ginger stood out the most. The soy sauce added a bit of salt and cut the sweetness of the agave. There isn’t one reason I won’t make this again. *Recipe for the rice and kale is not included here, but I seasoned the rice with with a little garlic powder, salt, and pepper. I also added a bit of Earth Balance buttery spread to it. The kale was made the same way, but I also added some fresh minced garlic when I steamed the kale. Add the sesame oil to a frying pan or pot on medium heat. When the oil is heated add the beans. Stir them around and coat them in the oil, then put a lid on the pot and let the beans cook for about 5 minutes. After five minutes, add the rest of the ingredients and mix well (at this time you can drizzle a bit more oil on if you would like – about a teaspoon of sesame oil). Add the lid back onto the pot and let the mixture simmer for a few minutes or until the beans are still crisp, but slightly more tender. 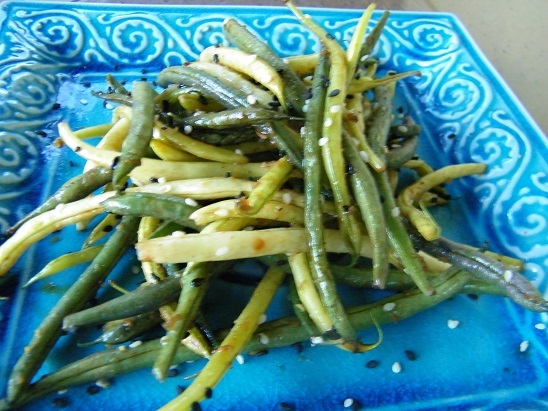 Serve immediately and top with sesame seeds if you like. Enjoy! I agree! Recently, I just bought a few more pretty dishes to help with pictures and plating. I’ll have to add a purple dish to the mix. Thanks for the suggestion!